Purpose: Sarcopenia - the term that describes the natural loss of muscle mass as we age and it is said that no one is immune to this process. Although exercise is the best known defense even the greatest atheletes lose their edge in time, and for most major sports 40 years of age is the end of the line. Scientific AmeriKen is now 40 and has reached the third time point of an experiment started 20 years ago (click here to review) with the purpose of determining if aging affects how quickly muscles gain strength. Hypothesis: Sadly Scientific AmeriKen was already showing signs of aging at the 30 year old time point as the rate of gain was lower 10 years after the first experiment. The most obvious hypothesis would be that Scientific AmeriKen will likely show greater slowing in the rate of gain. However, this "likely" hypothesis does not seem as pleasant as one that predicts scientific AmeriKen will stay forever youthful and will thus be rejected in favor of the hypothesis that Scientific AmeriKen will show equivalent rate of gain as his 20 year old self. Methodology: 30 year old Scientific AmeriKen came down pretty hard on his 20 year old self regarding the lack of well explained methodology, including one critical piece of information such as how much weight was actually lifted. 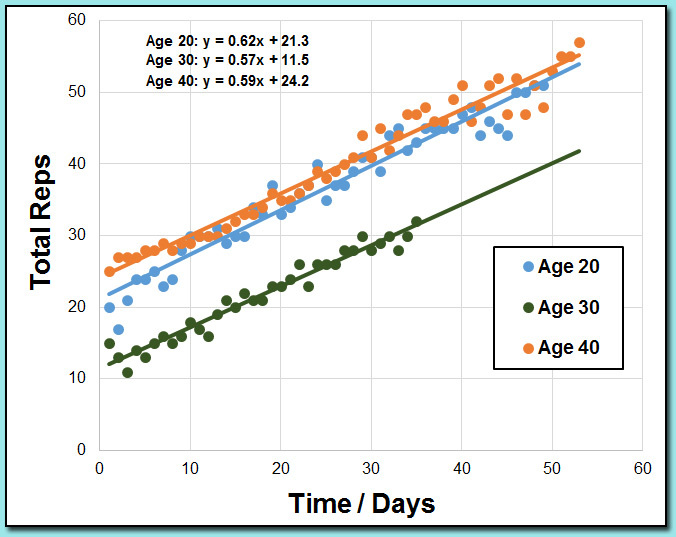 Yet, in creating the methodology for this experiment it was realized that important details were left out of the methodology described at age 30. For fear of reprisal from a 50 year old Scientific AmeriKen the experiment was carried out as follows. Before each experiment a 5-minute warm up jog was performed on a treadmill at speed setting 5.0 (believed to be 5 miles per hour). The bench press test started that included performing as many reps as possible at 117.2 lbs (bar was weighed). A brief 2 minute rest period was allowed (usually for data entry), and a second effort of the bench press was performed until exhaustion. Each attempt would go from the point the bar was unracked until it was re-racked - pauses while sustaining the bar were allowed. All exercises were performed daily starting anytime between 8-10 PM. Experiments were initiated on February 20th and continued for 53 days. A strength training program did occur prior to this experiment, however a 1 month break was taken before the starting this experiment. Undoubtedly some details are being left out - if you are reading this Scientific AmeriKen age 50, please have mercy. 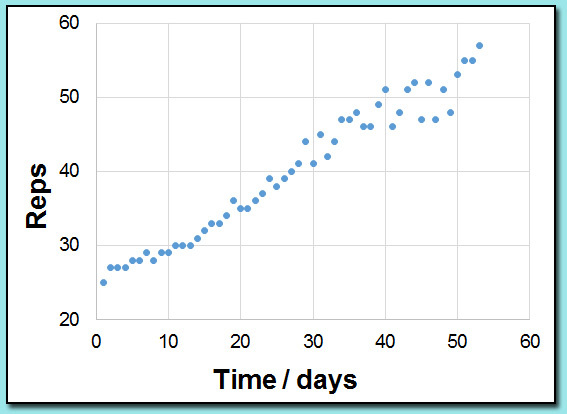 Results: The experiment continued for a total of 53 days which was longer than that performed 20 years ago (49 days) or 10 years ago (35 days). Unfortunately a computer malfunction resulted in a corrupt data file for experiment days 1-28 and these replaced as well as possible by memory. Over the course of the experiment Scientific AmeriKen increased the total number of reps from 25 to 57 (Figure Below). Next, Scientific AmeriKen compared the results of this experiment with the data from 30 and 20 years of age (Figure below). Surprisingly, the rate of increase was substantially improved from 30 years of age, gaining 0.59 reps per day compared to 0.57 reps per day as a 30 year old. However this was still lower than that of a 20 year old (0.62 reps per day). Additionally, prior to initiating this experiment, Scientific AmeriKen was able to bench press 6 reps at 166.4 lbs and perform 30 push-ups in one set. Following this experiment this number increased to 16 reps at 166.4 lbs and 50 push-ups, suggesting the bench press activity had substantial benefits in other areas of phyiscal performance. Discussion: The results of this experiment are very promising for Scientific AmeriKen as his muscles did appear to respond to the exercise in a manner that was similar as a twenty year old, and perhaps better than that at 30 years of age. However, there are many factors involved that may be playing a role. The first is the influence of geography in which the first experiment was performed outside in the hot sun of California, the second in a temperature controlled gym in Miami, Florida, and the third in a chilly basement during winter in Buffalo, New York. Added to this is the particular lifestyle at each time point as clearly Miami's South Beach likely took a toll on 30 year old Scientific AmeriKen's performance. Finally, greater knowledge of nutrition, including vitamin D supplementation, and recently completed experiments with nicotinamide riboside may have played a role in this experiment. All in all, the experiment has an excellent foundation to continue for years to come, although older versions of Scientific AmeriKen will likely grumble at 20 year old SciAmeriKen for his brash decision in choosing bench press, one of the most injury prone exercises, as the activity for this experiment! Question or comments? Click here to discuss at Sciencechatforum.com!